That’s part of a conversation I heard as I was scanning the 2 meter band on my ham radio recently. The conversation, or QSO in ham radio vernacular, was obviously between two gun enthusiasts. Or perhaps even two preppers. In either case, they were talking openly about just how much ammunition they had stockpiled and just how prepared they were. As I listened for a while, I learned of modifications they had made to some of their weapons; I heard stories of recent trips to the range. I just listened and learned. Was my listening unethical? No. They were talking on a publicly accessible frequency and using an open repeater to extend their transmission range. In the ham radio world, there is no expectation of privacy. In fact under most circumstances, encryption and other methods of obfuscation are explicitly prohibited under the FCC guidelines. New hams are encouraged to listen for a while to get the hang of how things work in the real world of amateur radio. Anything you say when you transmit on an amateur radio frequency is available for everyone to hear. Everyone. The airwaves are an open medium. Fellow preppers, like me, can listen and learn. Your neighbors can listen, and learn. Others can listen and learn, too. For example do you think that the Department of Homeland Security is monitoring the radio waves? What about the Federal Bureau of Investigations? Or maybe the Bureau of Alcohol, Tobacco, Firearms, and Explosives? Think any of those agencies would find eavesdropping on such a conversation interesting? I’d say so. There’s no such thing in the ham radio world. Title 47 of the Code of Federal Regulations, part 97.119 requires that amateur radio operators identify themselves at least every ten minutes while on the air and at the conclusion of any conversation with another station. Ham radio operators must provide their FCC-issued call sign, even if it’s just a short transmission to test your radio. Additionally, the FCC requires that each amateur radio operator maintain his current physical mailing address with the commission. Failure to do so can result in a suspension of your license. So, by eavesdropping for only a few minutes on a conversation that includes guns, prepping supplies, God, and the downward spiral of our economy, anyone, any agency, can quickly identify the person’s call sign. A quick search of the FCC database can produce the operator’s full name and physical address. So, Tell Me Why Again? 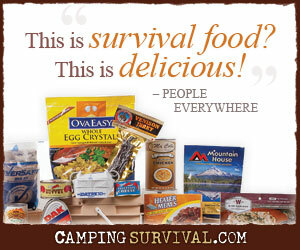 For the serious prepper, it’s not enough to acquire stuff like beans, bullets, and band-aids. The wise prepper will learn new skills. He will learn to identify wild edibles, to provide emergency first aid, and to start a fire without a match. Skills that could save his life. Not long ago, I suggested that ham radio could also be an integral part of your prepping plans. In times of emergencies, ham radio operators have provided much needed information to others. Sometimes to governmental agencies, but often to other hams. Imagine being able to bypass the mass media reports. Imagine being able to listen directly to those near the scene of an accident. Imagine not having a filtered presentation by the nightly news that leaves you wondering about their bias or propaganda. Imagine being able to listen to ham radio operators from other states or even other countries so you can know what is really going on. But, just as you must be careful with Twitter and FaceBook, you must also take care when talking on the radio. What you say may not be recorded forever the way it is with social media. But then again, depending on who is listening at the time, maybe it will be. I knew that communication wasn’t encrypted, but I wasn’t aware that you have to give your call sign that often. Or that finding out who the call sign belonged to was that easy. Thanks, Chris. Yes, having to register with the FCC, having to keep them updated with my most recent contact information, and having to transmit my call sign so frequently for the world to hear, gives me some concern. But in the end, I think the benefits will be worth it. I have a license and follow all the std rules of protocol (i.e. call sign ID, etc). However during a real crisis time when disclosure of ID may be undesirable I image many hams will use a fake ID or no ID at all. Unless regular transmission is done using the fake it will be next to impossible to track this down….. The security while transmitting makes sense. Don’t advertise what you do not want COMPROMISED, the same as any other public conversation with many listening ears. However, I do want correct one thing: the FCC requires a way to contact you via U.S. Mail. This can be a post box or via a remailing service. I did this for years while I was a full-time sail cruiser, roaming with no plan, from port-to-port. Many ham RV’ers also use remailers to forward their mail to their temporary location. That solves the physical location via callsign problem. The loose-lips-sink-ships problem, I’ll leave up to you. Can they (other ham radio operators) find you if you never use your call sign and never talk on a ham radio? What I am saying I just don’t want certain people to find me like a old woman friend which she has a ham. Can anyone just type my name to the FCC and get my address without my call sign?